Former Massey Exec Gets 42 Months In Mine Disaster Case : The Two-Way David Hughart is now the highest-ranking former executive of Massey Energy to go to jail for crimes related to the worst coal mine disaster in 40 years. 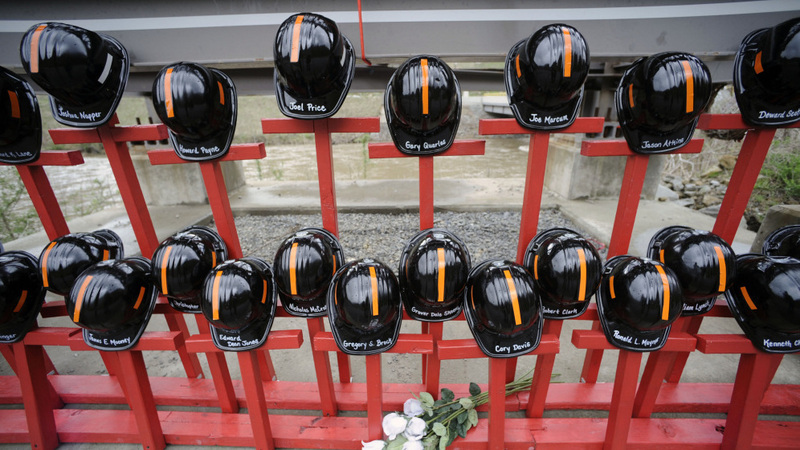 Mine helmets and painted crosses at the entrance to Massey Energy's Upper Big Branch coal mine, as a memorial to the 29 miners killed there. David Hughart is now the highest-ranking former executive of Massey Energy to go to jail for crimes related to the worst coal mine disaster in 40 years. On Tuesday, a judge in West Virginia sentenced Hughart to 42 months in jail and three years of supervised release. Hughart, 54, of Crab Orchard, W. Va., is also "the highest-ranking mine official ever convicted of conspiracy to impede MSHA [the Mine Safety and Health Administration] or conspiracy to violate mine health and safety standards," says Booth Goodwin, the U.S. Attorney for the Southern District of West Virginia. "This prosecution reiterates the message that mine safety laws are never, ever optional," Goodwin adds. Hughart had no direct involvement in the operation of Massey's Upper Big Branch mine, where 29 coal miners died in a massive explosion in April, 2010. But he was a Massey manager and executive for more than 20 years, serving as the senior official at subsidiary companies which controlled other coal mines. He is helping prosecutors gather information about the corporate culture at the company, which investigators blamed for the Upper Big Branch tragedy. In a plea agreement, Hughart admitted to being part of a corporate conspiracy to evade surprise mine safety inspections by giving advance warning to miners underground. Many coal mines are so big and so deep that even surprise arrivals by federal mine inspectors give mine managers time to warn workers. They can then fix obvious safety violations before inspectors reach them. In an earlier court hearing, U.S. District Judge Irene Berger asked Hughart to identify the participants in the conspiracy. "The CEO," he responded, in reference to former chief executive Don Blankenship, who denies any wrongdoing and has not been charged. Goodwin has indicated that he's aiming higher up the corporate ladder at Massey Energy as his criminal probe continues. Massey was absorbed by Alpha Natural Resources in 2011 but some former Massey executives, including those involved in the management of some of Massey's most troubled mines, continue in senior positions at Alpha. The sentence of 42 months exceeds by a year the top end of federal sentencing guidelines for the crime, according to Goodwin. Earlier Tuesday, Hughart's bail was revoked for his arrest last month on drug charges. But Judge Berger indicated that the additional time is due to the severity of the mine safety violation and not the drug arrest. "This sentence will promote respect for the law," Berger said, according to Ken Ward of the Charleston Gazette, who was in the courtroom in Beckley, W. Va.
Ward, a veteran coal industry reporter, also writes that the Upper Big Branch prosecution "is likely the largest criminal investigation of a coal-mine disaster in modern times." Court and company documents jointly obtained by NPR and the Gazette in 2011 indicate Hughart may not be the ideal witness for the government. In the documents, Massey said Hughart was fired in 2010 for failing a drug test and was allegedly involved in a kickback scheme and nepotism. Others charged and convicted so far include: a former miner who used a bogus license to become a mine foreman and conduct safety inspections at Massey; a security chief at Upper Big Branch, who was convicted of lying to investigators and attempting to destroy evidence; and a former Upper Big Branch superintendent who admitted to disabling a methane monitor at the mine, which is designed to prevent explosions.